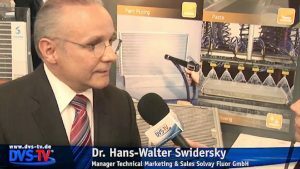 DVS-TV was underway at the 4th International Congress on “Aluminium Heat Exchanger Technologies for HVAC&R” in Düsseldorf, Germany, which took place in June 2015. The interesting video report is online since beginning of August. 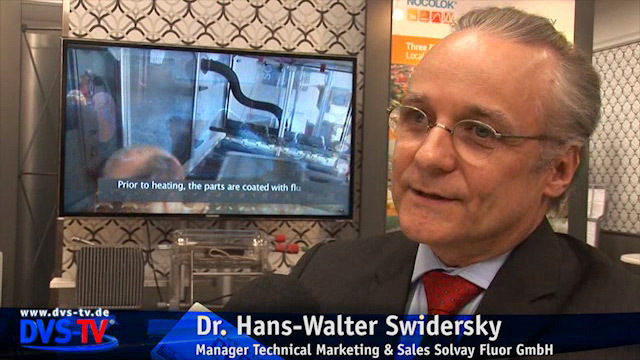 Among other things, coverage included Solvay’s presence and an interview with Dr. Hans-Walter Swidersky about NOCOLOK® Li Flux. https://www.aluminium-brazing.com/wp-content/uploads/2018/02/Aluminium-Brazing-Picto.png 0 0 https://www.aluminium-brazing.com/wp-content/uploads/2018/02/Aluminium-Brazing-Picto.png 2015-08-11 11:39:412015-08-11 11:39:41Video Coverage about the4th International Congress on "Aluminium Heat Exchanger Technologies for HVAC&R"
DVS-TV was underway at the Congress Aluminium Brazing in Düsseldorf, Germany, which took place in June 2014. The interesting video report is online since July. Among other things, coverage included Solvay’s presence and an interview with Dr. Hans-Walter Swidersky. 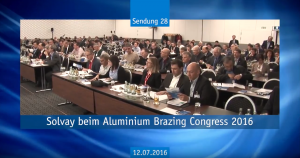 The 8th International Congress Aluminium Brazing will be again organised by DVS – German Welding Society respectively DVS Media GmbH. We cordially invite you to attend this 3-day-event, where expert authors will present papers about new developments and processes in and around brazing technology. More information, registration and hotel reservation you find on our website. Finally the programme of the 8th International Congress Aluminium Brazing is ready. The programme as well as the registration forms can be downloaded a PDF format here. On request I will send you the PDF files by email, too. I look forward to seeing you at the congress in June in Düsseldorf. Please do not hesitate to contact me for any further questions.